Foam, milk, and espresso. 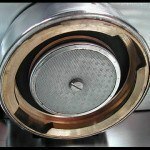 Just those three ingredients can make up at least four different drinks familiar to the general public coffee drinkers. Simple ingredients tweaked to perfection and taste leave for an endless possibility. Without being a professional barista, sometimes it can be hard to keep all these Italian and French names for coffee drinks straight. 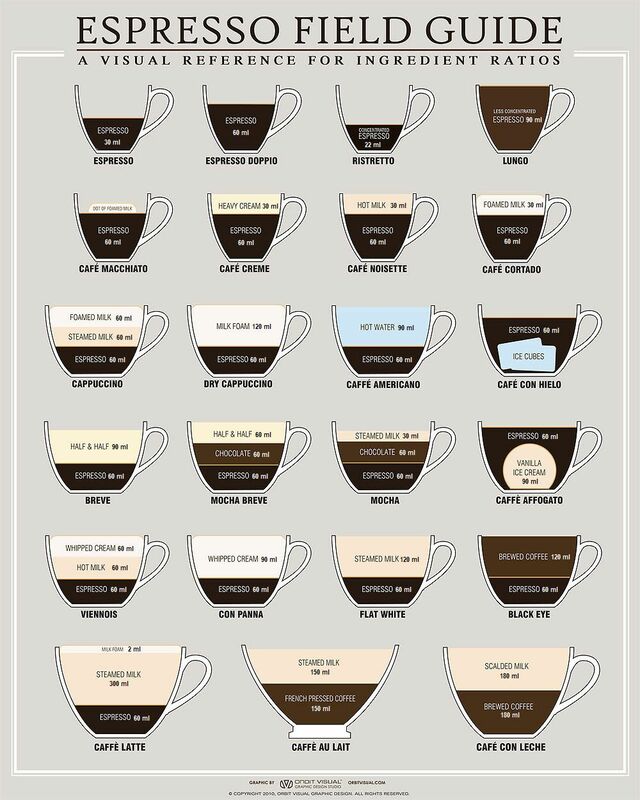 Even those familiar with coffee and the types of drinks that can come from espresso, struggle with naming them all. The drink of choice to be discussed today is the macchiato (pronounced: mah-key-AH-toe). – How many shots of espresso and how much milk? – Are they stronger than lattes? Alrighty, let’s get into it! Macchiato time! 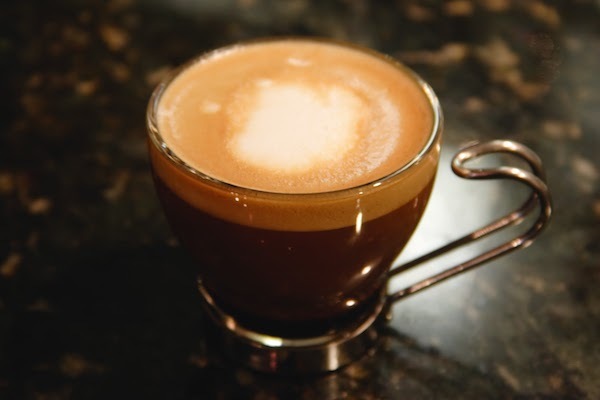 In basic terms, a macchiato is espresso, which is made first, followed by the addition of a smaller amount (often just a dollop) of steamed milk and foam. This is the traditional definition, and simplest. “Macchiato” in Italian means “marked” or “spotted”. Which is a good way to begin to look at the drink itself. The marking is essentially what is on top of the drink, like a signature. However, the marking is indicative of which liquid was poured in to the beverage second, whether it be espresso, or milk. Because it can be either, depending on the type of macchiato you’re making, be it a latte macchiato (milk first) or an espresso macchiato (espresso first). More on these two types of macchiatos shortly. Macchiatos have long been a part of Italy’s rich history of coffee-drinking and innovation, and a symbol of a standard of living that many countries strive for. 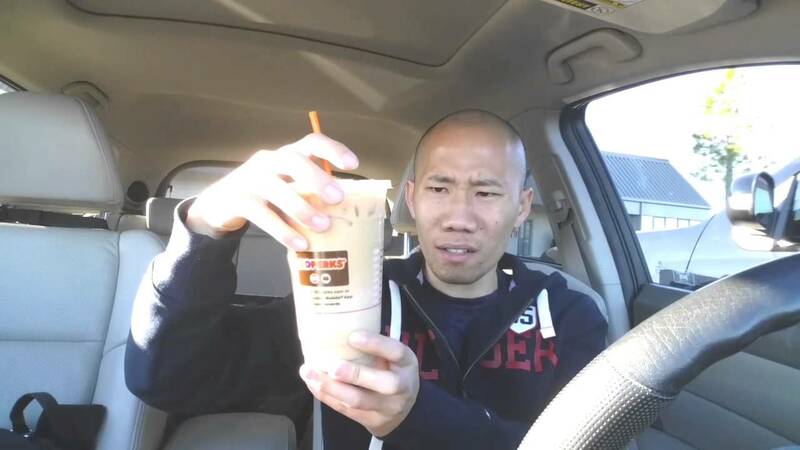 Because hey, if you’re drinking a macchiato, how bad is life, really? Espressos, cappuccinos, and the demitasse glasses these drinks can be served in are all part of that old Italian coffee culture that’s been around for centuries, and this also includes macchiatos. How Many Shots of Espresso and How Much Milk? People have asked, how many shots of espresso are in a macchiato? FYI, a macchiato is traditionally just a single shot of espresso, plus the milk. How much milk. It can be 2:1 espresso to milk, or even less milk, if so desired. Also, in terms of the number of espresso shots added to your macchiato, if it’s a coffee shop chain-made macchiato, which is unlikely to stick to any traditions, there will be two or sometimes even three shots added, depending on the size of the drink, the barista pouring it, and whether Jupiter is in retrograde. No, they will add more shots because it’s a bigger drink and they need to fill it with something. Another question we hear a lot is if a macchiato is to be served hot or cold? They can be served hot or cold, with the Starbucks cold caramel macchiatos being a big hit in the summer. Traditionally, macchiatos are served hot, not cold. Starbucks, as it does, is not one to adhere to the old, strict ways of making and serving espresso-based drinks. What about the level of sweetness in a macchiato? Speaking of tradition, the sweetness of macchiatos depends partly on how traditionally they’re made. If they don’t have any syrup in them, which traditional ones don’t, they’ll be less sweet unless sweetener is added in some way. If we’re talking certain coffee shop chains (again, Starbucks comes to mind), various sweeteners and syrups might be (and often are) added to their macchiatos. It should be noted that coffee chains like Starbucks aren’t exactly adding syrups and sweeteners to their macchiatos for no reason. Customers love these sweet, sugary drinks, and so that’s how they’re made nowadays. It’s by demand, people! Otherwise, if we adhere to traditional ways of making a macchiato, the only two ingredients are milk and espresso, which isn’t going to result in a very sweet drink overall. If you do try to invoke the displeasure of any old Italian coffee masters potentially watching from beyond the grave to any modern, non-tradition holding drive thru employees, let us know what they said to you in the comments! Another question that often gets asked is if macchiatos are meant to be stirred? Again, this all depends on how you personally like it, but traditionally, mind you, the answer is no. The reason being, macchiatos are meant to be experienced not like a latte where the drink it more or less blended, but rather the foam first, followed by the milk, and then the flavorful espresso on the bottom. You are meant to experience the drink not as one single flavor, but as multiple flavors experienced one at a time, starting with the foam on the top. This is assuming we’re talking about an espresso macchiato, one of the two types you’ll encounter and that we will describe in more detail now. People ask if macchiatos are strong? Well, that depends on a few things, such as how many shots of espresso are in the macchiato. If it’s a traditional macchiato, then there’s one shot of espresso , and it won’t be as strong as if you get a macchiato made with two or more shots. In terms of caffeine amounts, we’re talking about 75mg per shot of espresso. Also, “strong” is a subjective term which could apply to the caffeine kick that’s in the espresso itself that’s put into the macchiato, or it could just mean the taste of the espresso, and if it is overwhelming compared to the taste of the steamed milk. As such, the “strength” of the macchiato is hard to define, because of course it will depend. Let’s just say, if you find espresso itself to be strong, then you’re probably going to find macchiatos to be strong, because there’s espresso in them. And the more shots, the stronger of a taste you’re going to get. Are they Stronger than Lattes? People also ask if macchiatos are stronger than lattes? 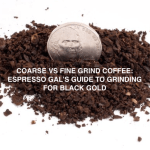 To this we say most definitely, because the espresso is less blended. With lattes you get a more consistent taste of the two liquids mixed together. With a macchiato, the espresso taste is going to hit you more directly. For someone to like a macchiato, they are going to need to enjoy the taste of pure espresso, whereas a latte masks the taste of the espresso more. 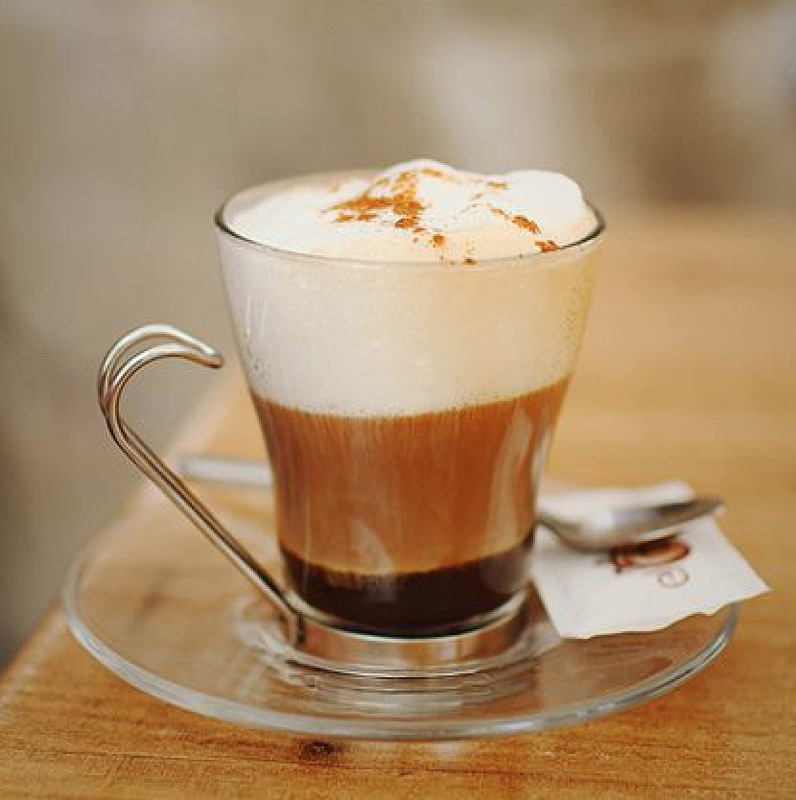 It is not uncommon to hear a macchiato called an espresso macchiato or latte macchiato. These are both considered macchiatos, yes, but they are two distinct types, leading to some confusion around what a macchiato actually is. We’ve been hinting at it this whole time, this confusion, and now we’re here to absolutely clear it up! If we’re talking about an espresso macchiato, we have espresso marked by steamed or frothed milk which is poured in after, followed by foam which sits on top. Remember, there’s not much milk added. Just a dollop, or 2:1 espresso to milk, and sometimes even less milk than that, depending on how you want it to look / taste. 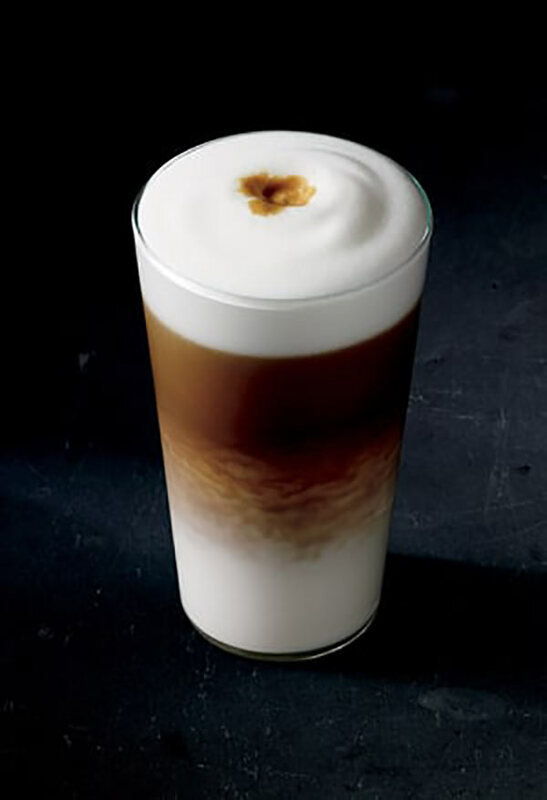 For a latte macchiato, we have the reverse in terms of preparation when compared to an espresso macchiato. Steamed milk is added first, in this case, followed by the single shot of espresso. 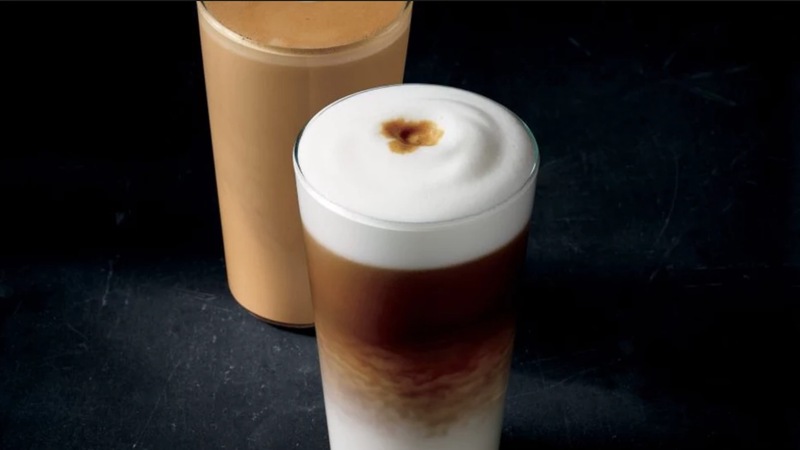 This preparation of the drink gives the latte macchiato a different look from the espresso macchiato, and a different marking on top, that being the espresso that is added last. So, we have described here two different versions of the same drink, each providing their own delicious taste experience. 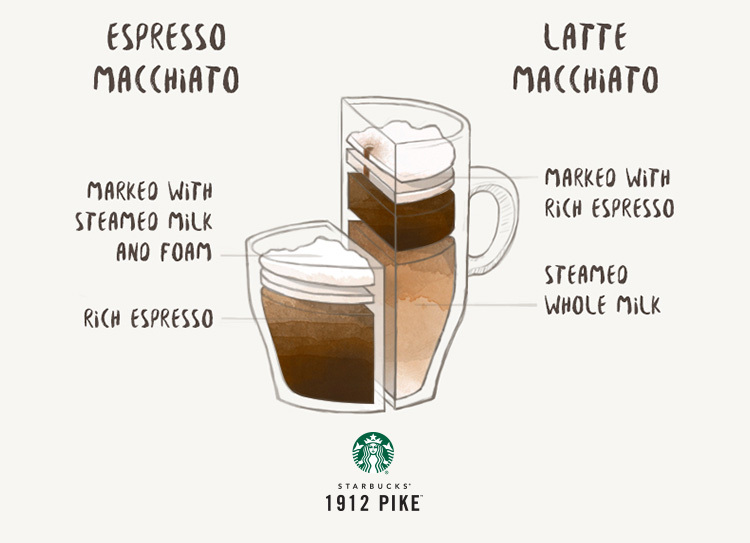 Take a look at this graphic, offered by Starbucks, to further differentiate between an espresso macchiato and a latte macchiato. As you can see, the way it is layered, and blended, is quite different in each case. They even differentiate the serving glasses, which is another consideration for you as a café or home barista making one of these babies. We think that the key here is the term “spotted” when it comes to the macchiato, because its particular markings indicate the type of macchiato have in front of you. If you are interested in making a macchiato, you’re going to have to pick the type you are going to make. Will it be milk on the bottom, or espresso on the bottom? There are so many ways to make this drink, that it can be intimidating for a beginner to try. But you might as well try, just to get the hang of it! 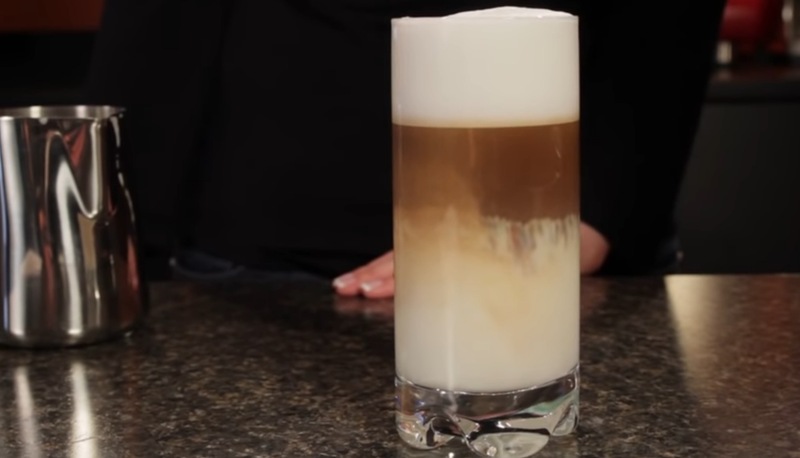 Here’s a great video showing how to make the two types of macchiato, from Whole Latte Love. As you can see, these two drinks look very different, but they share the same trait which is that each has been “marked” a certain way, to indicate the type of drink it is. People also wonder what the difference is between a latte macchiato and a café latte. Ohh boy… The confusion here is easy to understand, as some might think they are in fact the same drink. The definition of a latte is that it is a drink made from espresso and steamed milk, where the milk is added first, and then the espresso. But not quite. They are, in fact, different. 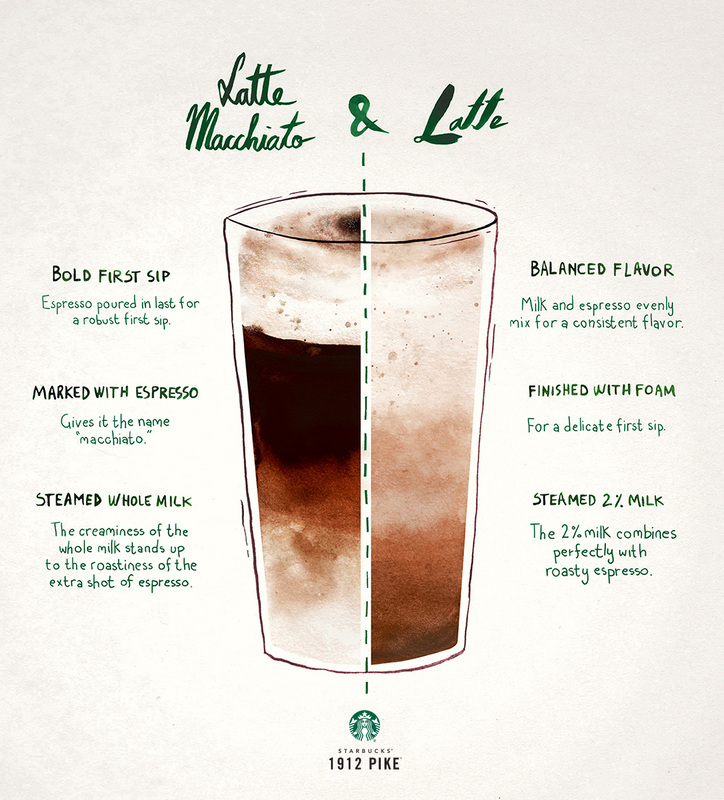 Here’s a great graphic that Starbucks made that shows the precise difference between these two similarly named drinks. The differences here are actually many between the café latte vs the café macchiato. As you can see, these seem like minor differences between these two drinks, but all of these minor changes do amount to two very different looking and tasting beverages. 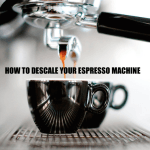 Here’s the part where we talk mainly to the non-purists, who don’t mind getting a little crazy and creative with their macchiatos, and shrugging in the direction of Italy and their traditions when it comes to macchiatos. 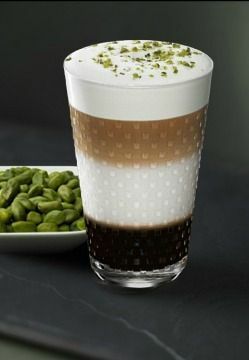 Gaze briefly at this almond pistachio macchiato for a moment if you will, and we think perhaps you will conveniently forget about whatever was happening hundreds of years ago in some country shaped like a boot. Purists, of course, will say that if you avoid the strict guidelines set out by the pros, and perhaps some Italian coffee elder who’s still out there somewhere, you are henceforth going into a territory which is no longer the domain of the macchiato, and perhaps taking too many liberties. But one only lives once! So in that case, let’s talk more about some variations on the classic recipe. Now, if a bold cup of java is not to your taste preference, macchiatos are no strangers to flavoring in recent years. 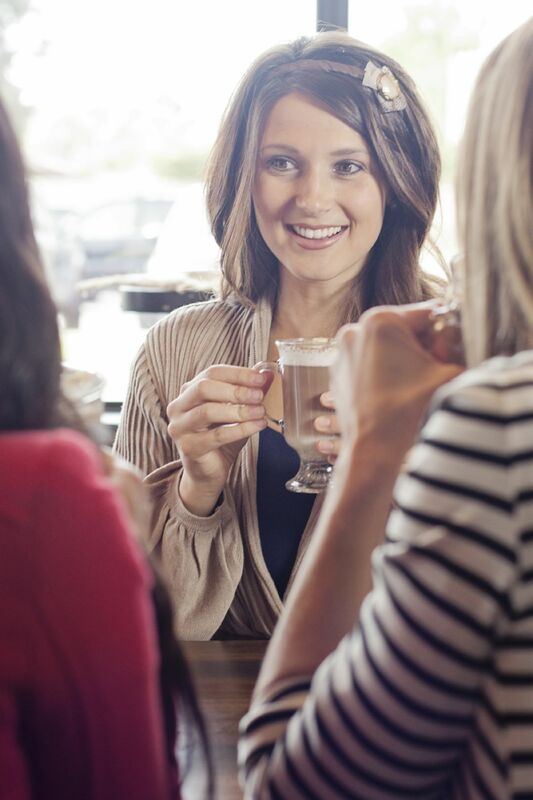 Many cafés and coffee shops have special macchiatos served with shots of vanilla, hazelnut, or caramel flavoring. Non-traditionally, these drinks are served both iced or hot, depending how you like ’em, making the macchiato as versatile as some other drinks, perfect for either wintery evenings or warm summer mornings. Since the macchiato is mostly espresso, some wonder why you would need a dash of milk at all. Well, if you take the milk away, then technically we’re just talking about espresso here. It’s just …not a macchiato anymore. Then you’ve just gone too far, buddy. If you want to be creative in that respect, and ditch the milk, you really are not even dealing with a macchiato at all, by any definition. It must have milk! IT MUST! So, our opinion is that people should feel free to experiment with their macchiatos, if they have that urge, but never forget the definition of what the drink actually consists of. 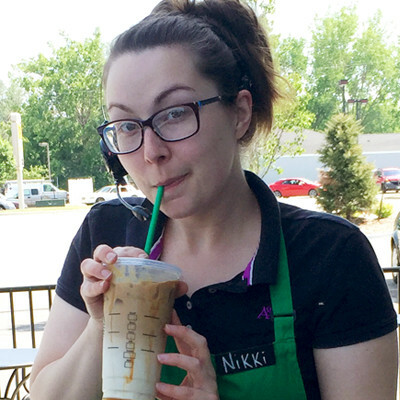 That said, check out this popular video by Pinkmacprincess showing how to make a classic Starbucks-style iced caramel macchiato. Lots of people love this drink, and it’s one of the more popular Starbucks summer beverages, from what we’ve heard. While many of us are not professional coffee makers, we strive to enjoy our favorite cup of joe frequently. A macchiato is a good start if you are not ready for a straight up espresso shot and your palate craves something with a touch of sweetness and delectability. 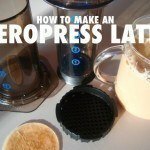 Or, flip it around and go for the latte macchiato. Just don’t forget to mark it with the signature “spot” the way the pros do. Even with a shot of flavoring, the macchiato is a good choice for any coffee lover. Enjoy, and please report back if you happen to come across any particularly inventive or otherwise awesome variations on this classic Italian coffee drink! 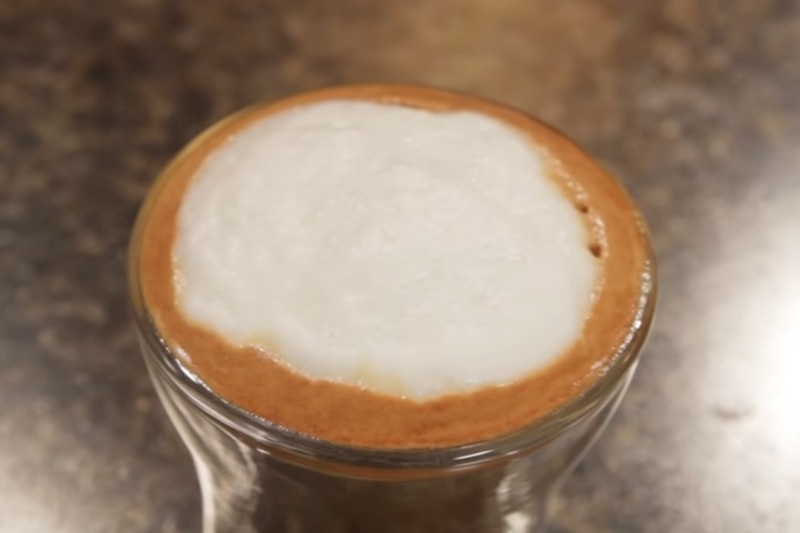 Here is a great video by HowcastFoodDrink featuring barista Mike Jones of Third Rail Coffee in New York City, showing how he makes a macchiato. 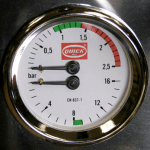 What Is Espresso Machine BAR Pressure? What Is A Group Head And How Does It Work?